Calliope Games may be working on their Titan Series of games, but that's not the only games project they're working on. They've just announced a new game that they'll be showing off at Gen Con. For this one, grab your striped shirt and black mask, you take on the role of thieves. 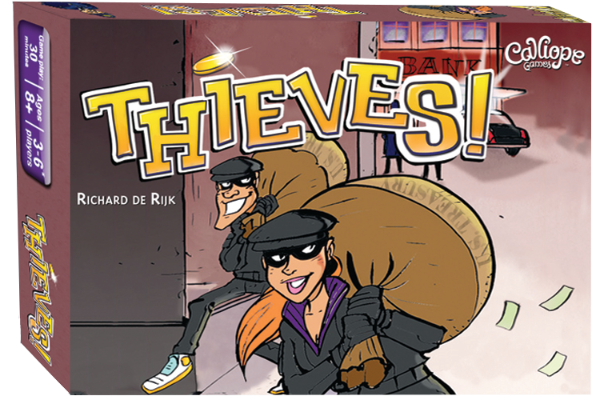 In Thieves, you and your posse are looking to grab all the loot you can. However, the cops are close behind, and not everyone can make it out. Be the one with the biggest haul to show you're the craftiest thief of them all. And as I mentioned, they will be at Gen Con this week. They've posted up a schedule of events they have planned, including meet-and-greets with some of the Titan Series game designers, as well as demos of all their games, giant-sized Tsuro, and more. I know I'm ready to get there.